Affiliations: Cranny, The Hybrids, Nook, "Salty"
Powers/Abilities: Pretorious possesses no powers, but is a highly intelligent scientist well-versed in genetics. (Generation X/Gen13#1 (fb) - BTS) - While perfecting his organ-transplant process utilizing the organs of super-powered beings to normal humans, Pretorious learned of the existence of Gen13, a group of superhuman teens and their mentor John Lynch. Deciding to create a situation in which he could capture these children without anyone realizing he was behind it, he invited several private schools to visit his castle, La Casa Del Sol, which he purposely misrepresented to be a modern hotel. (Generation X/Gen13#1 (fb)) - Pretorious welcomed the arriving members of Gen13 to his home, and had his assistants, Nook and Cranny, carry their bags. After they were attacked in a hallway by his ape-hybrid, Pretorious told them it was just a normal ape that he kept in his lab for studies that got loose. He then left to welcome the next group of students to arrive. (Generation X/Gen13#1) - Pretorious welcomed the arriving members of Generation X to his home, not realizing they too, had superpowers. The next morning, the two groups of students and Pretorious enjoyed breakfast. Later that day, while at the beach, the teen heroes were attacked by "Salty," Pretorious's man-fish hybrid. The creature returned to the castle, bringing the unconscious bodies of Freefall and Synch with him. Realizing this creature was tied into their host somehow, the members of Generation X and Gen13 returned to the castle, where they witnessed the professor explaining his plans. They crashed through the ceiling and confronted Pretorious, but he quickly subdued them with poison gas. When he learned one, Burnout, was missing and had gone back to town for help, he took the Hybrids with him to track the teen down. 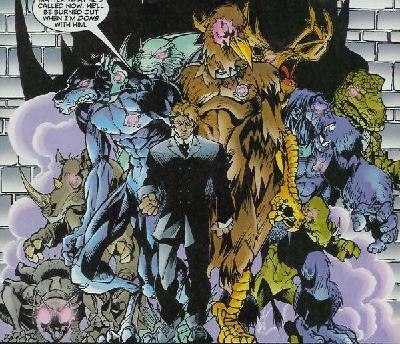 Shortly after finding Burnout, the rest of the members of the two teams, having escaped, joined in the fight against the Hybrids, many of whom escaped. Trying to get away, Pretorious was cornered by M and Freefall. John Lynch later handed him over to a government project where he could use his knowledge for their benefit. Comments: Created by James Robinson, Salvador Larroca and Troy Hubbsial Milgrom. Pretorious is referred to as Mister Pretorious and Professor Pretorious interchangeably throughout the story, so I'm just going with his name and no title. Obviously, he is patterned and named after Dr. Pretorius (played by Ernest Thesiger) in the classic Universal film Bride of Frankenstein (1935). This character was also involved in various unsavory scientific projects. Okay, headache time. This was a crossover between Marvel and Image Comics, in specific Wildstorm Studios, the studio headed by Jim Lee. There are literally a dozen different "Earths" this could have taken place on, but Earth-616 is almost definitely out. It could be on Earth-Marvel/Image, where most of the Marvel/Image crossovers took place (the ones that don't involve reality travelling). It could be on Earth-Marvel/Wildstorm, which by the time this came out would have been greatly removed from much of Earth-Image or Earth-Marvel/Image. At this point, Image, the company, was starting to break up, and the half-hearted continuity they were trying to establish in their books was going down the tubes due to the various studios leaving/breaking off. Soon after this crossover, Lee sold Wildstorm to DC, where it has remained since. I don't keep up with DC or Wildstorm, but I believe they have mostly kept them two separate universes. With that in mind, since Wildstorm IS now in the DC Multiverse (see their Majestic character now appearing in the Superman books), this could conceivably be on one of the various alternate earths where the Marvel and DC universes merged. Perhaps something to do with The Brothers, or perhaps it took place in the world created during the events of JLA/Avengers. Any of these are plausible, but for simplicity's sake, I'm just going with Earth-Crossover, which should cover all crossovers from all companies that do not include reality-traveling. Regarding the brothers, I think any of the crossovers COULD be Earth-616 if they represented briefly partially merging that reality with another. If such were the case, then the natives may well remember the merged realities as if they had always been that way. For the record, this was preceded by Image's Gen13/Generation X#1. The characters even acknowledge meeting each other before in the Marvel book. One more thing. As this was the Marvel end of this two-part project, presumably Pretorious and his Hybrids are owned by Marvel. Should James Robinson ever write for Marvel, it's conceivable that his Earth-616 counterpart may one day show up. Both were hunchbacks, and of somewhat limited intelligence. They assisted Pretorious in his experiments, and worked under the guise of bellboys during the teen heroes' stay. They were both knocked out by Freefall when the groups escaped after Pretorious knocked them all out. Pretorious created human/animal hybrids in which to test the superhuman organs he farmed. Along with "Salty," these included an alligator-hybrid (or possibly a lizard-hybrid), an ape-hybrid, a bird-hybrid, a deer-hybrid, a dog-hybrid, an insect-hybrid (possibly an ant-hybrid), a rhino-hybrid, and one more that appears to be a boar-hybrid. All had control collars which allowed Pretorious to dictate their actions. 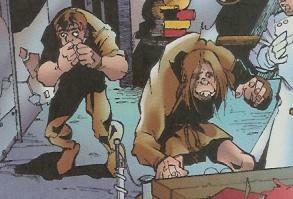 After initially being attacked by the ape-hybrid, the members of Gen13 realized that Pretorious was behind "Salty" as well. The Hybrids were taken by Pretorious into town during the Day of the Dead festival to track down Burnout. There, they fought the various members of Generation X and Gen13. After the teams defeated the creatures by removing the collars, some of them were rounded up, while many escaped. 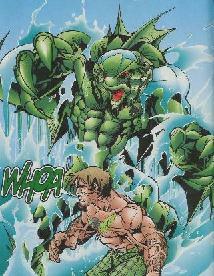 One of Pretorious's Hybrids, the fish-hybrid attacked various members of Generation X and Gen13 while they were swimming at a Mexican beach. He then took Synch and Freefall to his master. During the fight with the teens, "Salty" escaped and was briefly spotted by M swimming out to sea. This creature had no official name, but was dubbed "Salty" by Burnout.